Based as I am in Kildare, I'm near enough to Dublin and the Midlands to be able to enjoy both, although honestly I prefer to be in the countryside! Last weekend my friend Sue was on a short visit from Donegal and as the rain (kind of) held off on Sunday, we decided to head to Duckett's Grove in Carlow. I've mentioned Duckett's Grove before as it's one of my favourite places to do markets. The disadvantage of that, I suppose, is that I rarely have time to have a proper leisurely wander and I was really dying to have coffee in the Tearooms, run by the lovely Madeleine and her family. I was fairly hungry by the time we got there as I had been pottering around doing candle stuff in the morning so it was straight into the Tearooms when we arrived. If I had been organised enough I would have booked the afternoon tea but as I wasn't we just opted for coffee and dessert. Everything looked so pretty and festive and it was warm and cosy with people already having afternoon tea and tables set daintily for soon to arrive visitors. Mark had the same as me and enjoyed it just as much as I did. Coffee was great and what I love about the Tearooms is that it has such a nice relaxing atmosphere - lots of books to browse through - we each picked one to have a look through and it really makes you feel like you can stay and chill out for a while. Lovely music in the background adds to this and honestly it was hard to get up and move but we did want to take advantage of the weather (not rainy!) to take a little walk, so we stirred ourselves and said goodbye. Outside, the light was soft and I was able to take pictures of the castle and ground, beautifully kept by Carlow Tourism. It really is such a gorgeous place to visit, although the castle is mostly in ruins, it's a magnificent site and you can also have a little walk through the walled garden. Here are some of my impressions of the day. We wanted to have a slightly longer walk so drove on through Tullow to Altamont Gardens. We have been here many times and it's known in particular for it's wonderful collection of snowdrops but it's good to visit any time of year. The light was fading and we were so late arriving, we only had 15 min but we had a walk around and already I could see hellebores and some snowdrops peeking through the soil and a few summer roses still in bloom! It was actually wonderful to stroll through the gardens in the fading light, there was an air of tranquility and the water was so still, with white as snow swans gliding through it. It was a wonderful way to spend the day and I felt relaxed and revived by the time we got home. 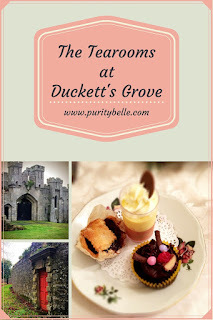 I'd never heard of Duckett's Grove or Altamont Gardens - what a lovely day out! Will definitely keep in mind when venturing further afield. Lovely pics. Great photos. It looks like a really nice day out. I do love castle ruins. I love the treats. Looks like you had a great day. Castles are great to capture. What a gorgeous day! I know lots have already said it but fabulous photography as well.